What did you like about the book? What a great book! This is a book about the importance of being honest but it is also hilarious. In this story, two animals have prized possessions — Owl has a big red balloon and Monkey has a sock with a red star and a big hole. Owl asks Monkey to hold his balloon for a minute which proves to be a big mistake. Monkey cannot resist playing with the balloon and he covers it with his sock, ties his sock on the string of the balloon and eventually whacks it a couple of times with his sock. Not surprisingly, the balloon pops into a huge red mess. 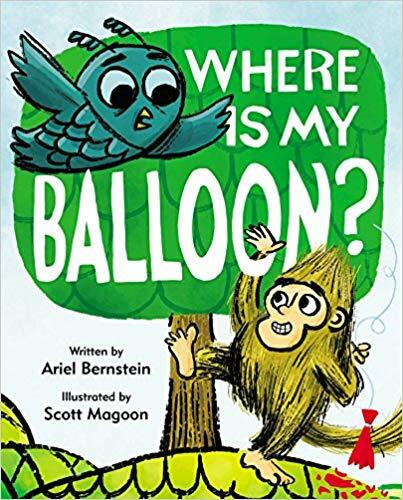 When Owl returns asking for his balloon, Monkey goes to great lengths to bring him something big and red — a pillow, a chair, a fire truck, even a parachute. Finally, Monkey cannot stand it any longer and tells Owl the truth. Owl is very upset and goes on a little rampage but eventually forgives Monkey. Monkey then tells Owl that now the two of them can play with his sock together — however, when you look back to the page of Owl having his rampage, we see Monkey’s sock being torn into tiny pieces. Now it is Owl’s turn to find a substitute for Monkey’s sock. Certainly a great book for discussing telling the truth and being honest when something bad happens. To whom would you recommend this book? Perfect for children between the ages of two and five. Who should buy it? Public libraries, preschools, daycare centers, anyone that works with children between the ages of two and five. Should we (librarians/readers) put this on the top of our “to read” pile? Yes, funny but with an important message. This entry was posted in *Starred Review, Book Review and tagged Simon & Schuster. Bookmark the permalink.